There is the belief that education means scientific, technological or industrial training. But if the world of education is to experience a flowering in which a variety of sensibilities – artistic, scientific, and poetic – are to flourish, what Tagore called the dreary desert sand of dead habit, has to be crossed. Almost all accounts that I have heard or read about Santiniketan by old students, contain anecdotes of some unique and intriguing aspect of the place. Old girls and boys reminisce knowingly of the closeness to nature they experienced as children, or the vivid colourfulness of the festivals of dance, drama, art and craft, or the benefits of outdoor classes that were so pleasant.1 The thread that runs through all these narratives is the fact that long after they have left school, memories of Santiniketan remain with these individuals, continue to influence their ways of thinking, and has much to do with what they choose to do in life. These are telling words and actions. Boredom, a feeling of restriction within the walls of a classroom, the earth and the skies only glimpsed through the windows, and made contact with during intervals between classes, are the plight of millions of children across the country today. Poetry is laughed at in today’s educational programmes – why wouldn’t it be when the pursuit of competitive excellence in the sciences is given prime importance? Scientific excellence should definitely be striven for, if after careful consideration, the student thinks that it is indeed the subject she would like to specialise in. But a culture in which the exclusive pursuit of science and technical subjects is encouraged by schools and parents is pervasive in the country today. While there is a profusion of courses offering other options, scientific, numerical, analytical ability is still considered, by a large majority, to be an indication of worthiness, intelligence and success in life. Tagore saw in the rationality of science an opportunity to free the minds of the majority of his countrymen from superstitiousness. He held conversations with Einstein on the importance of the observer in science, rather than an independent, absolute truth. Tagore’s view was that neither complete objectivity nor the perception of beauty was possible without an observer.5 Poetry, it wouldappear then, is not too far away from science. Taking a cue from conversations of this kind, it is interesting to ask if scientific study in our country (at the school level at least) could be accompanied by a study of the processes of science. Science at the senior secondary level at least, instead of becoming a series of formulae to be derived from principles, could be taught in such a way that the student gets a glimpse of the aims of science – the search for beauty and order through rigorous methods of observation and calculation; the involvement of the senses in scientific observation and experiment; and finally, of science itself as one among many ways of looking at the world. Thus, if talent in a subject (other than science) is to flower, patient and consistent observation of a child’s inclinations should first be established. This may not be possible in most schools, as music and art are not given enough space and time – a period a week for each. The child whose learning patterns are artistic, musical or largely sensory is, then, by the age of five or six already in a position where shehas to spend the majority of her day with activities which she is not especially inclined towards–numerical activity, linguistic skills, elementary analytical ability and so on. Also, artistic talent is usually ‘spotted’ through festivals that are competitive in nature. These festivals could remove their competitive aspect, and all students (not only those chosen by teachers) present what they have worked on during their art and music classes. Teachers will not find it difficult to identify children whose learning patterns are predominantly musical, artistic, dramatic (which involves a number of skills and intelligences) and so on. ‘Parent’s day’ could become a day-long festival of drama, dance, art and music in which all children participate. 1 See Sen, Amartya. The Argumentative Indian: Writings on Indian History, Culture and Identity. ‘Tagore and his India’ (New York, Allen Lane Penguin:2005):115. The chapter on Tagore gives a comprehensive account of his views and attitudes on a variety of subjects – the West, Patriotism, his relationship with Gandhi, his views on education and so on. 2 Ed. Soares, Anthony. Lectures and Addresses by Rabindranath Tagore: Selected from the Speeches of the Poet. ‘My Life’ (London, Macmillan:1955):13. 3 Anna Akhmatova’s poem. ‘The Muse’ describes the poet’s awed attitude when she encounters her muse. 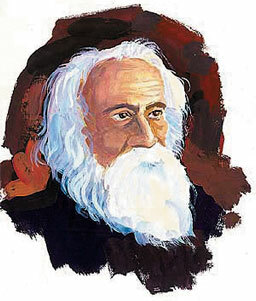 Tagore’s inspiration is, however got from a source different from the personalised, mythological muse that Akhmatova describes – he found his in the natural beauty of his surroundings; his poetry too is filled with a sense of wonder and awe in the variety of forms, colours, sounds and fragrances in nature. Ed. Paine, Jeffery. The Poetry of our World: An International Anthology of Contemporary Poetry. “The Muse” Anna Akhmatova (New York, Perneial Harper Collins: 2000):224. 4 Ed. Chakravarty, Amiya. A Tagore Reader. “From Talks to Students in China” (Boston, Macmilllan:1961):207. 6 See Soares, 1955, the chapter entitled ‘My School’:37-39.